Luca di Montezemolo: Our morale is low after the conclusion to this season, but that's sport. We had everything in place to win the title with Fernando but today, things did not go our way. All the same, I want to publicly thank the team for being capable of getting to the final round still in the fight for the Drivers' title, staging a fight back which back in July, almost everyone considered an impossible task. We believed in it right to the end and today's result should not cancel out what we have done this season. In all but two of the last fourteen years, Scuderia Ferrari Marlboro has reached the final race of the season either in the fight for the title or having already won it. Fernando has had an extraordinary season, demonstrating his strength and determination, always being close to the team and making an exceptional contribution. Domenicali has done a great job, keeping the team united at all times, even in the toughest moments. It will take us a little while to get over this disappointment but we have to keep our heads up and be proud of what we have done. Finally, I want to thank our fans, who have always believed in us: when one sees so many Ferrari flags and so many people coming to visit our park here in Abu Dhabi, I am happy that Ferrari is still operating at a high level, especially for them. Stefano Domenicali: There is a great sadness at this moment, because to come so close to our goal and to see it slip away for just a few points really hurts. We made a wrong decision in terms of strategy for three reasons: we marked a rival with two cars, we were unduly concerned about the wear rate of the soft tyres and we did not take into consideration the difficulty of getting past other cars on the track. Now, there is no point in discussing the whys and wherefores of how we arrived at this choice: win or lose, we do everything together as a team. At this time, I would like to thank our fans who have always demonstrated their great affection. This was probably the worst race of the season, but when you lose by just a handful of points, it's clear that the title was not lost here, or at least not just here. 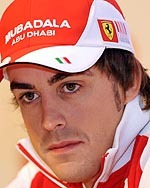 I want to congratulate Fernando, who is an extraordinary driver and an extraordinary person. He demonstrated powers of leadership from both inside and outside the cockpit and we will do all we can to give him and Felipe an even better car next year. I wish to thank the team for the great effort they have always put into their daily work, at the track and at home: few people outside the company would have thought in mid-July that we would have made it to Abu Dhabi leading the world championship. Sure, and I repeat myself, now we are sad, but we have to keep our heads held high. We are Ferrari which means we are condemned to having to win, so a second place is a defeat: but this is also part of sport and we have to accept it. Finally, congratulations to Vettel: he had the quickest car and in the end, he was the best, which the points table proved. Felipe Massa: It's a real shame the way things went in this race. We had decided to pit early to try and stay ahead of Webber, but we did not manage it and we were then stuck in traffic for almost the whole race, both myself and Fernando. Unfortunately, the cars ahead of us were very quick in a straight line and it was impossible to overtake. At a fantastic venue like this, it's a shame that overtaking is so difficult. For me, it has definitely not been a great season, as I had expected a lot more out of it. Now we need to react and try to prepare as well as possible for the next season. We made mistakes and we must try not to repeat them. Already, we have two days of testing next week with the new tyres: I am curious to see how they behave. Fernando Alonso: It's a shame to get to the end of the season and then lose the title at the final moment, but that's racing, that is sport. Everything went wrong today, from the start itself to the strategy. With hindsight, it would have been better not to pit so soon, but it's easy to say that when you have all the facts: however, it was definitely not an easy decision. I want to congratulate Red Bull and its drivers: over the course of the season they have had a little something extra than us and they deserve to be where they are today. I had said it over the past few days: this is still a great season. There have been some very intense months and I found myself in a team that has an amazing atmosphere. Now there is some sadness, but I am sure that in a few hours, with a clear head, we will begin to appreciate better what we have achieved. We have to continue like that, staying united and determined. We have to face next year with the same will to win which has characterised this one and, something I learned very quickly, is also in the Ferrari blood. We must improve the car and ensure that the mistakes that all of us - we drivers and the team - have made during the year, are not repeated. Chris Dyer: We are all very down at the moment. We had the car, the team and the driver with which to win the title but we did not manage it because we made the wrong decision in terms of strategy, and there is no point in making excuses. We concentrated too much on what Mark was doing and we then were left bottled up in traffic and that cost us the title. You could say we looked too closely at what was going on behind us without seeing what was in front of our nose. It's a shame because losing like this hurts, it hurts a lot.